Today’s competition offers the chance to win a signed copy of Digressions. If you read this blog regularly, you’ll know I often hold competitions and I’ve blogged about my new pieces a fair amount already! If you would like to know even more about them you can click here. 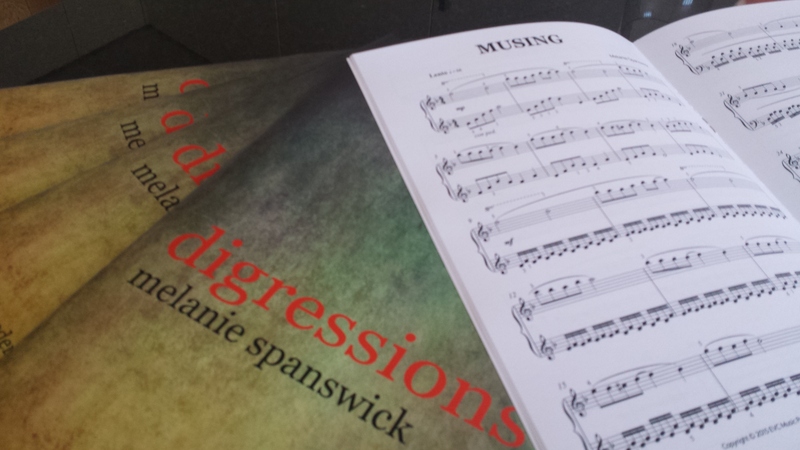 Digressions consist of 5 short piano pieces intended for pianists of intermediate level (around Grades 4-6 ABRSM), and they are designed to offer something different for those seeking alternatives to the usual jazzy idioms prevalent in Contemporary educational piano music. These short pieces from the videos seem fun to learn and good practice for techniques! The cover design already catches my attention. I suppose because the earthy colors are in my palette. These pieces all sound great. Chasing is a good exercise for dexterity, and it has a nice classical ending. Moving On is a nice Étude-like piece to practice wrist motions and musicality, especially in the right hand. Karma is a good workout for practicing playing hands close together without getting the fingers caught up with each other. It has a lovely ending. Musing is great for developing a music box sound. Nice Alberti bass. Digression is good for developing speed and lightness of touch. Very nice. All in all, this is a beautiful collection of contemporary pieces that could fit in just about any repertoire. These pieces seem fun to play. They look like great pieces for students who can enjoy playing and performing them. Would love to win!!! 😊. Thanks!!! I have a student who would love these pieces. You are a lady of many talents. I know my students would love these pieces. Hoping to bring Melanie’s beautiful music to the Deep South of the United States!! I know my students here in the great state of Mississippi will love learning your compositions and I will enjoy playing them, too!! Digressions (cool title) would be perfect for several of my students. One in particular, with autism, would eat this up. I’ve organized his lessons for years so we he does technique first, classical, and finishes with Jazz. Routine is so important. If it were up to him, he would play jazz and worship music all day! Thanks for the excellent blog. I’ve fallen in love with these pieces. Have already downloaded Karma and I’m eager to play it. Hope to win the whole collection of Digressions! I’m always looking for new pieces for my students. Finding new music by women composers is also a plus, as my daughter is a composer as well. I would love to win! I enjoyed watching the videos of the pieces from “Digressions” and would love to introduce your compositions to my students so they can see that classical music is not just written by males who have been dead for a long time! I really enjoy presenting my students with new music, and being able to tell them a bit about the composer. I hope I win this book. Id love to check this out- I have several intermediate students hoping to try new music this summer! This is wonderful and would be a great addition to my students’ repertoire! My summer project if I win! Would love this book! I have listened to all of these pieces and watched your videos…. Great pieces! This seems aimed right at my level. Thanks for this opportunity! I am looking forward to listening to the recordings of these pieces this morning! Would be perfect for a pupil of mine. Will, of course, be buying a copy anyway! Would love to play and teach these pieces here in Montana, USA! Many thanks for all the excellent comments. This competition is now closed.